Incredible surroundings! Well kept grounds and decent room. The wait for front desk staff was too long at all times of the day. There were times when there was nobody at front desk for extended periods of time. During our stay, the temperatures were higher than usual and most of resort activities were unavailable. Yet, staff did not provide us with any alternative options. Clean, quiet, luxurious, with a breath taking view. As always, a great experience. Staff that continue to go above and beyond to accommodate their clients is an unusual experience at almost all hotels, but not at the JPL. Pool and amenities are great. The activities and food was excellent. One of our doors was left open after cabin housekeeping had visited. One of our taps in our sink was leaking.One of the doors would not work with card after opening the door once. A quick check on the cabins before arrival would alleviate such inconveniences. Overall we enjoyed our week emencly. We thoroughly enjoyed our time at this weekend. The activity choice was good.... the food was great..... the service exceptional. Thank you. I felt pampered, respected. Your staff are without exception amazing. I came there to heal...and I did. It was a great few days in the mountains and JPL is always a wonderful place to stay. My only small complaint is that there was only a bathroom mirror and no other mirror in the room (could have used one more somewhere in the room). Staff is always friendly and helpful. We really enjoy the relaxing atmosphere. The staff is so friendly and helpful. The meals were excellent. The chefs were so accommodating with my allergies. From the moment we arrived until our departure three days later we encountered very pleasant and accommodating staff that made our time most enjoyable. They were there when needed but otherwise we were left to do as we pleased. Looked after very well. Everyone helpful and food good. Excellent room - definitely updated since we last stayed in that type of room. Disappointed that basically all restaurants were closed except for the lounge. We had plans for a birthday dinner that would not be possible. Everything was great. We were just thinking back on it and there is literally nothing that we can complain about. Will definitely be back! We are a growing family of six, spread out between Ontario and Alberta. Although it has become increasingly difficult to organize family reunions, we managed to carve out a week in early April where we could all gather at the Jasper Park Lodge. From the moment our butlers greeted us warmly and escorted us to our luxuriously appointed Ridgeline cabin we were embraced by the magic of our surroundings. Our only regret was in not having extra days. We are truly grateful to everyone at Jasper Park Lodge who helped make our stay an unforgettable one. The stay was great, we loved the upgraded room and the staff was very attentive. Overall, I was pleased with the stay. The food served at the restaurant was delicious and the scenery was beautiful! The only things that were disappointing was that the hot tub was not functioning on the two nights of our stay and there was noise/banging above our room that works us up several times throughout the night. The Fairmont was an overall pleasant experience, but it did not live up to the standards I expected and I've had better experiences at other, lower-end hotel chains. 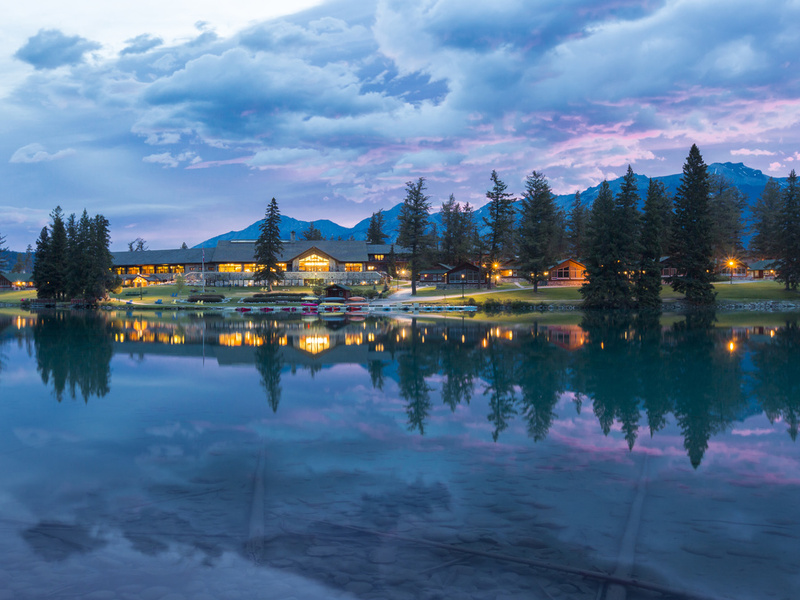 The views and location are where the Fairmont Jasper Park Lodge wins - the stunning, breathtaking scenery, trails, and ample wildlife are incredible. Those can't be overlooked, and are for sure the highlight of the location. If you look past the spectacular setting, the facility itself is super tired and in need of an upgrade, at least the main building. My room had cracked shower tiles, dirty windowsills, pink/peeling grout, the worst water pressure EVER (it seemed like the shower head was broken), the toilet barely flushed. The bed was super comfortable, the view from my room was amazing, and the amenities in the room were perfect, however. Food wasn't worth the price. At their main restaurant near check-in I paid $30 for an okay burger, frozen-seeming fries and Heinz ketchup. The homemade chips and pretzels that came with were the highlight. The next day I had a Cesar salad drowning in dressing (which was very good! but too much) and cheap fake bacon/parm along with a decent chicken club. Again, I just had higher expectations and overall, glad I ate away from the hotel most of my time. The views at the restaurant were to die for. In the cafe downstairs, however, I had one of the best London Fogs I've ever had and the service was great. The staff were very kind, helpful, and service was quick. The only downfall was valet... they kept making assumptions that I was staying in the cabin, which was much lower priced than my actual accommodations. Maybe it was just coincidence and how they speak to everyone - but it felt pointed, and possibly directed at me as a young, solo female traveller. Their comments seemed to assume I would be staying in the lower-cost facilities. Overall... I had a great experience... I just had higher expectations in terms of the quality of facilities and how I was treated in some aspects. If I was staying in a standard 3-star hotel I wouldn't normally leave a negative review, but I had certain expectations from the Fairmont.